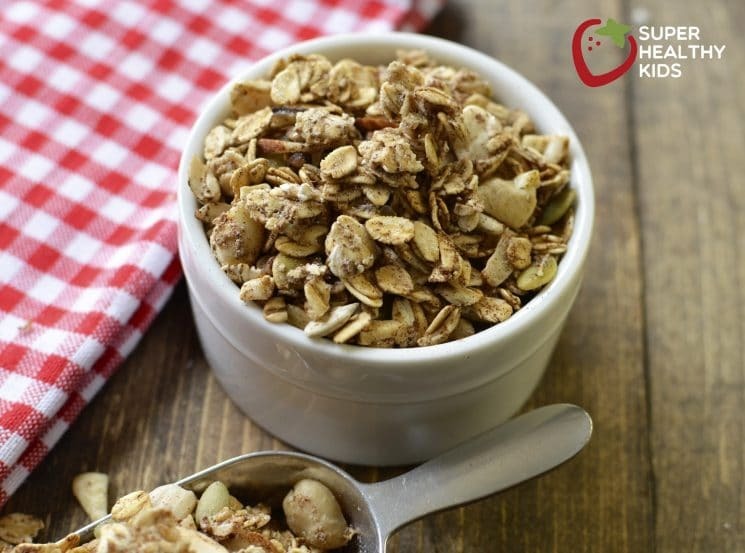 If you’ve been looking for a healthy granola recipe with ZERO grams of sugar, this is the one! Instead of sugar, it only has healthy fats, protein, and energy boosting, complex carbs. The best part about making granola sugar free is that you can add so many delicious fruits for natural sweetness! 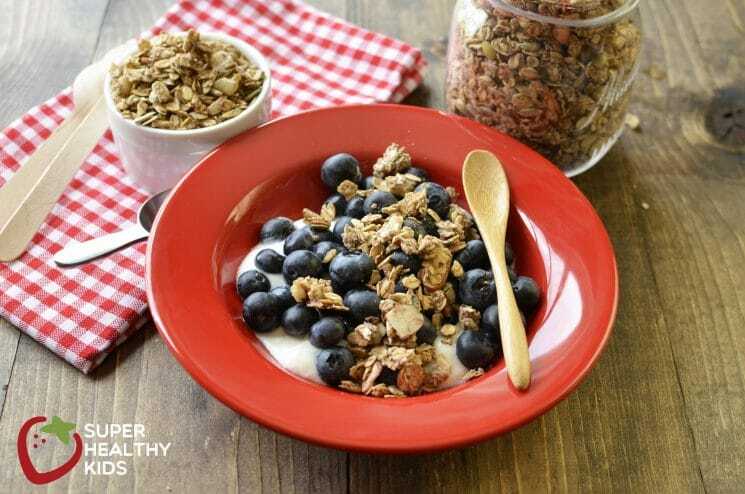 Whether you add dried fruit to take the granola on the go, or fresh fruit like blueberries to mix into your breakfast, that is 100% where we want to get the sugar we eat- fruit sugar is ALWAYS good for kids! For that, we’ll never back down. 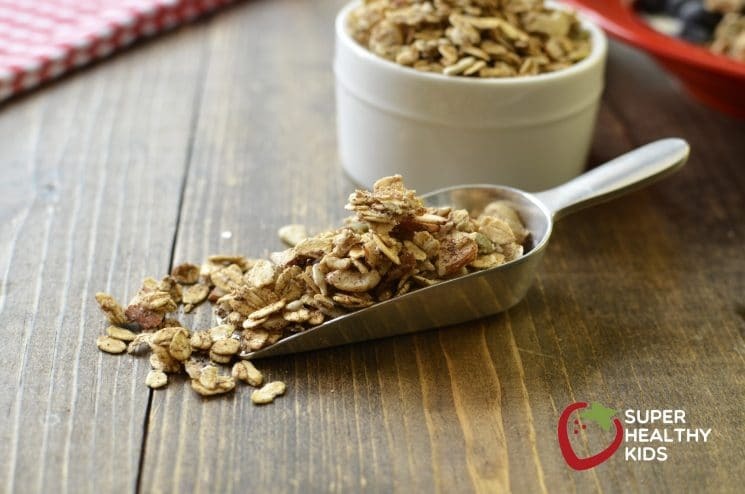 So, the problem with sugar free granola, is the end goal is a crispy, crunchy texture. The crunch usually comes from heating sugar. The longer sugar is heated, the crunchier your food gets (think hard candy, brittle stage). The lower the heat of your sugar, the chewier something is (thing granola bars, vs. granola). So, the question on my mind was, how do we get crunchy granola with NO SUGAR at all! Then, It occurred to me that we could do it just like we make our world famous, best tasting, cinnamon almonds– with egg whites! For those allergic to eggs, I DID try to repeat this entire recipe using coconut oil and other oils, but the granola NEVER got crunchy. In fact, it was only soggy. 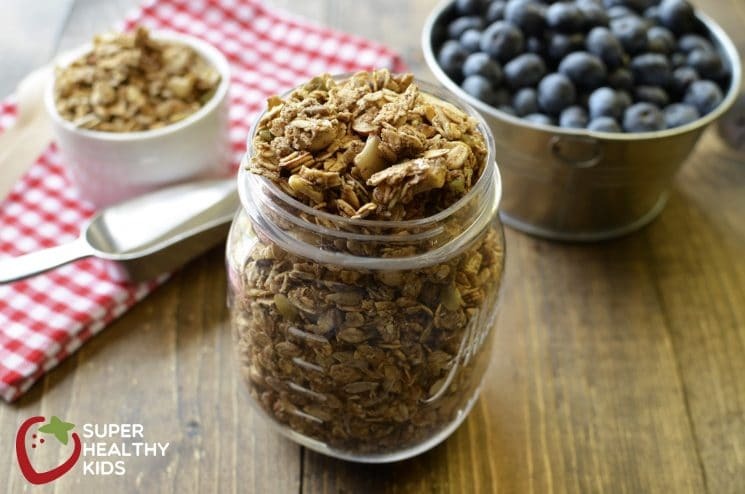 If you can’t have eggs, you may just need to follow a regular granola recipe, like our 5 ingredient granola, or 5 minute granola! 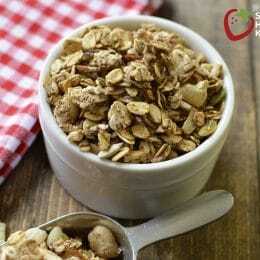 In large bowl, combine oats, nuts, seeds, cinnamon and salt. In a mixing bowl, beat egg whites until soft peaks form. Fold egg whites into dry oat mixture. Stir gently until dry mixture is coated. Turn oat and egg white mixture onto a cookie sheet (lined with parchment paper or a silpat liner). Bake in pre-heated oven for 60 minutes, stirring every twenty minutes. 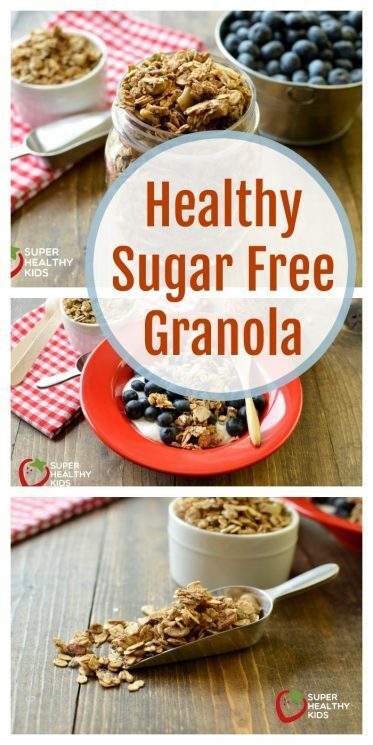 Is there any way to make a nut free, sugar free granola? THK – I’m afraid there would be nothing left but oats! I made this without nuts or fruits. I used your recipe (LOVE IT!!) but only included oats, egg whites, no sugar/low fat coconut, cinnamon, and a little pumpkin pie spice. It is not sweet at all, but it is exactly what I wanted. It perfectly compliments my cottage cheese & fruit parfaits. The texture is exactly what I was looking for — thank you so much for sharing your recipe!!! Hello, I’ve made different granola recipes but always end up with a bitter after taste. I find the oats have this taste after I bake them in the oven. Any idea why I even bake them for less time but they still get these after taste. I would really like to make this recipe but I don’t want to throw it away. This ever happens to you? I wonder if aquafava would work instead of egg whites? I’ve never tried that product Roimata! It’s amazing! It’s just the left over liquid from a tin of chickpeas and you can whip it up exactly like egg whites. You can make meringues and all sorts of things using it instead of beaten egg whites. Your recipe indicates that the granola would last 1 to 2 weeks. Can it last longer in the refrigerator? I’ve never stored it in the fridge, but I imagine it could! Is there any way this could be made into bars or cookies please? Perhaps packing it in to a baking tray rather than stirring? I have an oats based cereal that I really like and I want to turn it into a crunchy bar without adding any more sugar, but I can’t work out how to stick it together. Thanks. That might work, but I haven’t tried it Helen! Perhaps there is an omission in the recipe? The text calls for 1 cup of seeds/nuts, but the recipe calls for 3/4 cup. Thank you! I’ll fix it. I also have the question whether to use 1 c. or 3/4 c. dry ingredients. Directions list three 1/2 cup ingredients, but specific it must equal 2 cups. Is there another dry ingredient missing, or are the portions wrong? Thank you for clarifying. Sorry Jane= NOW it’s fixed! This looks like a great alternative to sweet granola. I’d probably try flavouring it with pumpkin pie spice or gingerbread spices for the fall and winter. Wouldn’t there be some natural sugars from the nuts? I know cashews, for example, are quite high in sugar. In the commentary you state beat the eggs until soft peaks, but in the receipt you state hard peaks. Please let me know which is correct. Soft peaks are sufficient, hard peaks may be easier to work with. They both would work. But I”ll change it to soft to be consistent. Thanks! Have you tried using applesauce or concentrated fruit juice to get a little bit of sweet? Do you think it would still crisp as nicely? I made your original recipe today so I’ll have something to compare and want to play with it a bit next time. I haven’t tried it, but I’d love to know how it turns out Adrian! 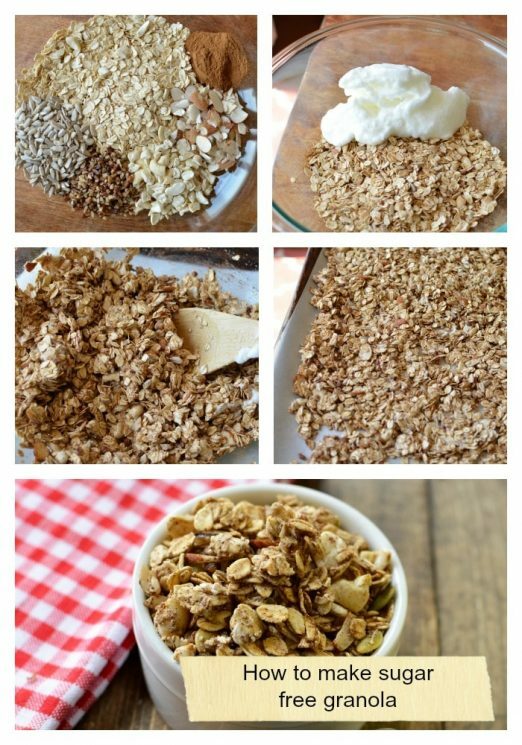 Are you using quick oats or regular oats? I’ve used both Lisa, and they both turn out great! Looks delicious! Would it be possible to add cocoa powder (and at which stage) to make a chocolaty version of this? Also could I add a bit of honey or will it mess the consistency? I haven’t tried those Yasmeen! Let us know if you do. I found your blog as a result of this recipe. It is great and I can feel less guilty about adding chocolate chips for my chocolate fix. I do stir less to get bigger clumps in the finished granola. I also add 4 egg whites instead of 3 sometimes depending on eggs. Thanks so much. Thanks for the feedback Elisa and welcome! This is amazing!Absolutely love it! Came out perfect!Finally have a sugar free crunchy granola recipe. Definitely won’t last for more than a week.Thank you so much! Hello! My little sister and I love this recipe, we gave it a go this morning. She managed to keep it sugar free but I needed a little chocolate kick today (oops!). Loved it that much, I had to mention it on my blog as I’m doing a sugar-free series currently. Hi Amy, I’m a writer with Care2.com and I’d love to include a link to this recipe in one of my articles. Is it alright if I also use a photo? Thanks! Sure zoe! We’d love for you to share! Shredded coconut flakes add a little sweetness as well. Just add halfway through the baking. Delicious. Our daily granola since we found out my husbans was pre-diabetic. He’s always taking some on his business trips and we’ve been passing on the recipe to many people! Making a weekly batch by doubling the ingredients. The Nutrition information is listed differently in two places in this article ( body of the article and green nutrition information box) . Which is correct? I have candida and was looking for a sugar free granola when I cam across your recipe. This looks great, thanks! Do you think this recipe will make good granola bars if you don’t stir it during baking? Love it … do you ever add honey? This recipe is awesome! Thank you so much. I tried it yesterday and the result was so good although i am not a good cooker. I used some quinoa together with nuts and I liked the crispy flavor this made. I’m thinking to add some honey I r cranberries as I am eating the granola. This may be tasty. Thanks again. I will try your other recipes as well. Did you pre-cook the quinoa in water? I’m interested in trying that version. I’ve never tried it Lonalee! Let us know how it goes if you do. Not yet, but I’m working on one!! Thank you so much for posting this! I had been jumping through some odd hoops to get my morning oatmeal “crunchy,” and this has been an excellent solution. I like to keep mine just straight oats/egg whites, preferring to add the nuts when I prepare my serving each day. My ratio is one cup of oats for each egg white, 1 tsp salt for every 6 egg whites. I use a 18×24 pan for a batch of 6cups oats/6 egg whites. It typically needs 2 hours at 225 to get as done/crunchy as I like it. Each morning, I warm it up a bit in the microwave, add some coconut oil, lots of nuts, and savor every bite! Thanks again! Excited to try this as keen for no sugar granola option. Great British bake off this year had vegan week, they used chick pea water (aquafaba) to make meringue…. just wondered if this would work for those that are egg allergic?? Or whether it wouldn’t crisp up. We haven’t ever tried it, so honestly it is hard for us to say how it would turn out. But if you try it, we would love to know the results! Thank you, I am allergic to coconuts and trying to find a recipe without wasn’t easy. The other part I love is crunchy. I crave crunchy more than anything. I make today. Thanks for the recipe, my granola turned out great! I’m sure I’ll be making it again, possibly experimenting with different spices! I am wondering what whipping the egg whites does for the recipe? My guess is maybe it keeps them from being soaked up by the oats or something? I’m curious to hear your reasoning. Hi Halii, so glad you liked it! Whipping the egg white helps the texture of granola get super crispy in the oven. (Think of crispy meringue.) It also mixes easier with the oats when whipped. How much is a serving size?? You have had several people ask about adding Stevia to this, and no one has written back about how it worked out. I added Swerve (Erithryol and Stevia) to the mix in the bowl with the oats, walnuts, cinnamon, and salt. I was making some for my sister and my friend, as well as myself, so I doubled the recipe and added one cup of Swerve. It took a little over double the egg whites, and I cooked the large pan for 3 1/2 hours at 250. I also added a little vanilla to the egg whites while beating them. My family can’t tell the difference between the granola I’ve bought at the store and this batch with Swerve. It came out awesome! Kim, thanks so much for sharing! I’m glad it turned out so well. Looking forward to making this,, I will be back with results,,? I know that others have mentioned using chickpea water to beat and make a sub for egg whites, but I happened to be boiling dried chickpeas and the white, stiff, foam forming at the top is amazingly like the egg whites. Has anyone used that for this recipe? If so, how much do you use? And could you beat the water from boiling dried chickpeas? Any thoughts?